Warner Bros. Home Entertainment provided me with a free copy of the Nancy Drew and the Hidden Staircase Blu-ray I reviewed in this blog post. The opinions I share are my own. Uncover the Mystery now! Nancy Drew And The Hidden Staircase is now available from Warner Bros. Home Entertainment on Digital and on Blu-ray™ Combo Pack & DVD on April 2, 2019. Executive Produced by Ellen DeGeneres, the film stars Sophia Lillis (IT and “Sharp Objects”), Sam Trammell (“True Blood” and “This is Us”), and Linda Lavin (“The Good Wife” and “Alice”) and follows Nancy Drew in her new town, making new friends and on a mission to solve the case! Go to my previous post to play the Nancy Drew Escape Room game for FREE! I really enjoyed watching Nancy Drew and The Hidden Staircase! It’s usually difficult to predict what your opinions of “smaller” film will be. I had high hopes for this movie, though, since the cast consisted of several talented actors that I’m familiar with. I loved Sophia Lillis in IT, and I used to watch Linda Lavin in “Alice” all of the time. The movie definitely lived up to my expectations. The movie was a lot of fun to watch. I’ve said before how much of a Nancy Drew fan I am, so I really liked seeing how the story was modernized for today’s young fans. Bullying is one of the underlying themes in Nancy Drew and The Hidden Staircase. And it isn’t just the obvious bullying. Yes, Derek is a bully, but everyone knows it. When you watch this with your kids, make sure you talk about the not so obvious bullying that goes on. Helen has always been seen as the mean girl, but she is just as insecure as most teenagers. Just because someone is pretty or has nice clothes doesn’t mean they don’t have insecurities. When Helen tries to explain her feelings to the girls, George never gives her a chance. She’s bullying Helen though she may not realize it. She doesn’t give Helen a chance to talk, and this makes Helen feel even worse about herself. Helen was trying to reach out to them. Teach your girls to listen to what others around them are saying. If you’ve ever watched Mean Girls, you know that the “mean girls” weren’t just the obvious ones. It’s the same here. The way that the mystery develops and is solved wasn’t contrived at all. It’s really realistic, and I think your middle school/junior high kids will really enjoy watching this movie as much as I did. I hope that there will be more of these because the way the movie ended set it up for what we Nancy Drew fans know as The Mystery at Lilac Inn. I’m ready for it! 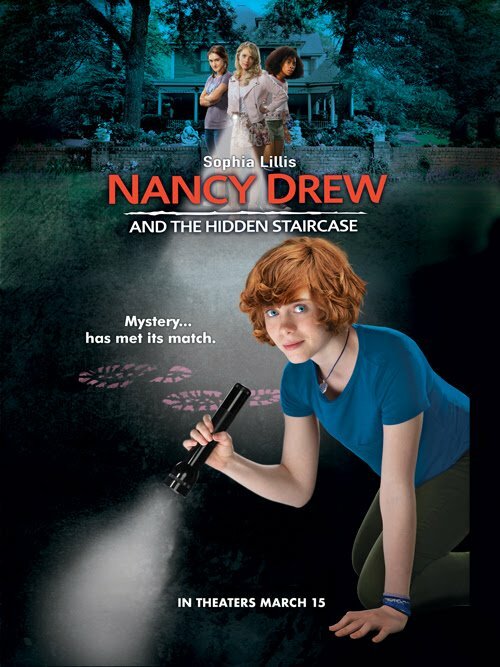 One of my followers will win the Nancy Drew and The Hidden Staircase movie. This giveaway is open to the US only ages 18+. This giveaway is void where prohibited. The sponsor will ship the prize to the winner. By entering this giveaway, you’re agreeing to the privacy policies of this blog. Entrants need a profile picture on their social media accounts, or your entry will be void. The winner has 48 hrs. to claim the prize or another winner will be chosen.